In the year of rookies and playoffs - The Byron Nelson in Irving, Texas followed suit when 25 year-old Keegan Bradley beat Ryan Palmer on the first playoff hole with a par after Palmer's approach went in the drink. Some of you older golf geeks might remember Keegan's grandma. She is LPGA Tour great, Pat Bradley, who has won 31 times including 6 majors. When asked for comment grandma said, "Big whoop - call me when you've won 20." Wiki "consistency" and you will find a picture of Luke Donald. After knocking on the door for several weeks, the 33-year-old Brit finally broke through after beating Lee Westwood on the first playoff hole in the BMW PGA Championship at The Wentworth Golf Club in England. Luke has finished in the top ten in 14 of his last 15 starts. In a year with a sidelined Tiger and a barely existent Phil - it's refreshing to have a guy who quietly goes about his business be rewarded. Good job Luke! 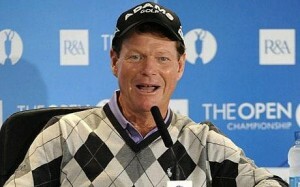 At age 61, Tom Watson can still get it done. He won the Senior PGA Championship at Valhalla becoming the oldest to win a Major and the 3rd oldest in Champions Tour History. He got up and down from a bunker on the first playoff hole to beat David Eger. He really hadn't been playing well all year, but this week something just clicked. You might remember Tom gave us all a incredible ride a few years ago coming just one short putt from winning The Open Championship in Turnberry and breaking every record every dreamed of by an old geezer. Congrats Tom! While I was being drenched in my tent, Maria Uribe was soaking up the sun in Rio and pouring in birdies like Caipirihas. (That's a Brazilian cocktail.) The 21-year-old Colombian shot a 66 on her way to winning the HSBC LPGA Brazil Cup 2011 beating Lindsey Wright by one stroke. The big boys go to Jack's tournament - The Memorial in Dublin Ohio. The new #1, Luke Donald, will be in the field. Tigger will not - out with a bum paw, but Phil is attending. The Ladies will be playing in Galloway N.J. for the ShopRite LPGA Classic. Ai Miyazato won last year. And finally the kiddies will be in College Park, MD for the Melwood Prince George's County OpenSite. "Two Gloves" Tommy Gainey won the even last year. Until next week... Hit it.. go find it... and hit it again.